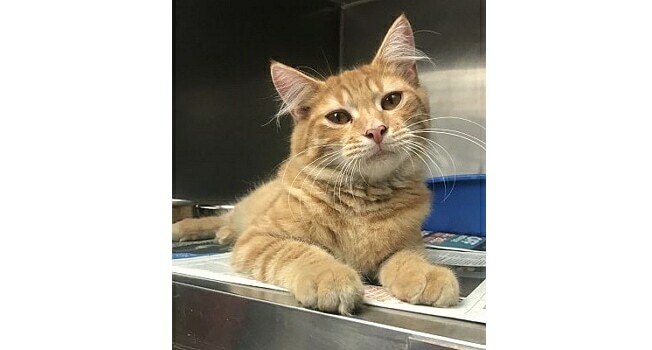 This is ShereKhan, one of the evacuated cats from Carteret County Animal Shelter during Hurricane Florence. Read more about him and the other animals on the organization’s website. 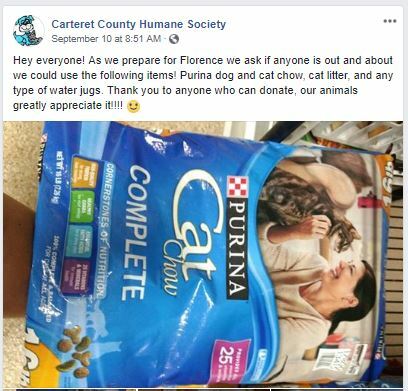 As prepared as they had tried to be for Hurricane Florence, the Carteret County Humane Society was in trouble. The facility was taking on water. The roof was in danger of caving in. They were in need of immediate help to move the 123 cats and dogs and three staff members to a safe location. The organization had put out a call for help early on, seeking donations of food and other items in preparation for the impending storm. Still, they did not anticipate that at following first signs of flooding and moving to the second floor, they would become trapped by the impeding roof collapse. Groups took up the mantel to help, but while there were reports that around 8:30 p.m. on Friday evening animals and staff had been safely relocated, it seemed that was not entirely the case. 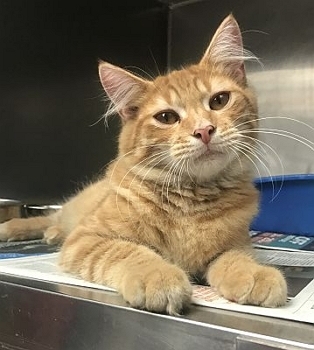 Shelter manager, Cassandra Tupaj, told the NewsObserver their team was still waiting on more crates as there were still 80 cats and 43 dogs that were waiting for rescue. That was at 10:45pm. The good news was by Saturday noon, Tupay told the news agency that, “rescue groups (are) on the way to help. Animals are all OK!” Staff had remained with the animals overnight. “Staff are exhausted and still working hard,” she said. 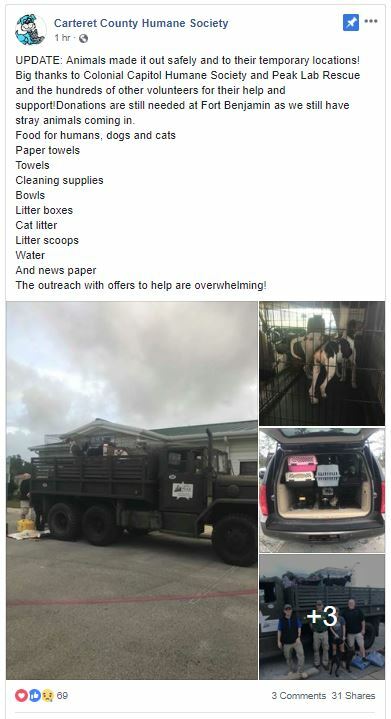 The animal shelter reached out via Facebook, as well, during and following their evacuation to Fort Benjamin. 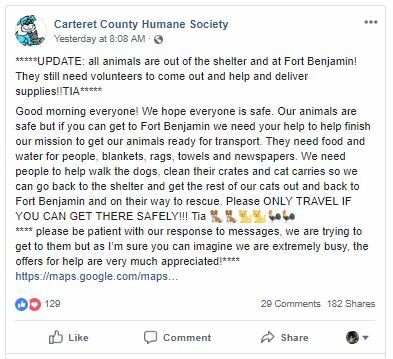 There is still much to be done for Carteret County Humane Society and other organizations throughout the region seeking help and assistance. Whether that is rehoming and fostering some of the animals, providing services, food, funding, even a pair of helping hands, take a moment to see where you can help. Every little bit will be appreciated. To donate to the shelter, click here. I’m so glad these kids made it out safely. I live in Canada and hope the hell all will provide food for these kids. And perhaps some comfort and maybe new forever homes. Thank you all for helping these kids in need. ANYONE EFFECTED BY THE HURRICANE PLEASE LET ME KNOW. Is anyone in need of somewhere to be for the next two weeks with their dog? I’m in Mt Pleasant, just before Charleston. I have 2 extra bedrooms and each has its on bathroom. I can only take people with dogs because I have three and they would eat a cat. The dogs must be fully vaccinated please. I wish those little poor cats and kittens found a shelter. So heart breaking to look at them suffering.